Two spectacular tails of X-ray emission have been found behind the galaxy known as ESO 130-001. ESO 137-001 is plunging into a galaxy cluster causing its cooler gas to be stripped by the cluster's much hotter gas. 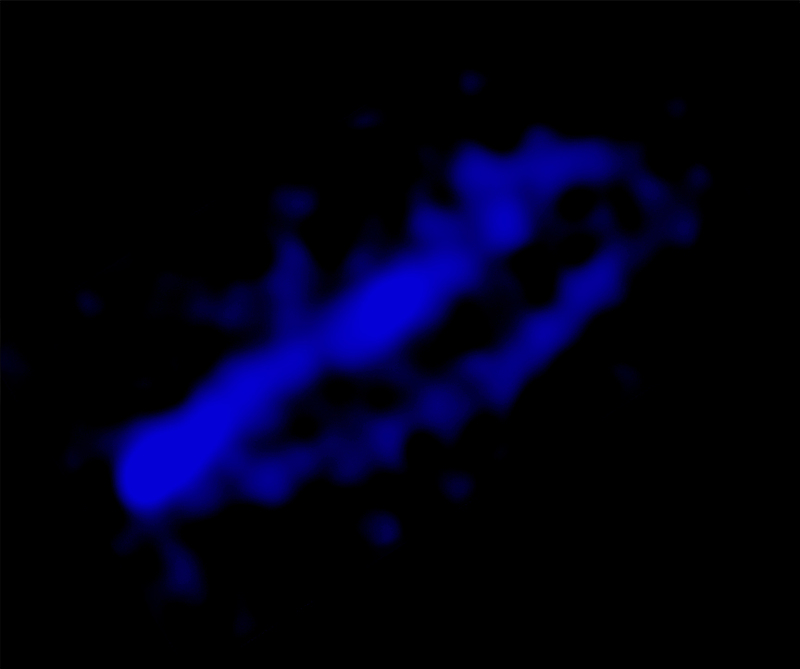 Phenomena like these in ESO 137-001 have a significant effect on how galaxies evolve. Two spectacular tails of X-ray emission have been seen using the Chandra X-ray Observatory trailing behind a galaxy. A composite image of the galaxy cluster Abell 3627 shows X-rays from Chandra in blue, optical emission in yellow and emission from hydrogen light -- known to astronomers as "H-alpha" -- in red. The optical and H-alpha data were obtained with the Southern Astrophysical Research (SOAR) Telescope in Chile. Galaxy clusters are collections of hundreds or even thousands of galaxies held together by gravity that are enveloped in hot gas. The two-pronged tail in this system may have formed because gas has been stripped from the two major spiral arms in ESO 137-001. The stripping of gas is thought to have a significant effect on galaxy evolution, removing cold gas from the galaxy, shutting down the formation of new stars in the galaxy, and changing the appearance of inner spiral arms and bulges because of the effects of star formation. The H-alpha data shows evidence for star formation in the tails -- the first unambiguous evidence that star formation can occur when cold gas is stripped out of galaxies as they fall through clusters. The Chandra data also reveal an excess of luminous X-ray point sources around the X-ray tails. Some of them are considered to be young massive binary stars associated with nearby young star clusters, giving more evidence of star formation in the tails. The implication is that a large portion of stars between cluster galaxies can be formed in situ. The X-ray data also reveal that there is little change in temperature of the hot gas in the tails, and also little change in width of the tails with distance from ESO 137-001. Both of these features present challenges to scientists doing simulations of the galaxy tails. Credit X-ray: NASA/CXC/UVa/M. Sun, et al; H-alpha/Optical: SOAR (UVa/NOAO/UNC/CNPq-Brazil)/M.Sun et al. Coordinates (J2000) RA 16h 13m 25.59s | Dec -60° 45´ 43.10"
If absolute zero is the lowest temperature, what is the highest temperature? Thank you Robert for the note. 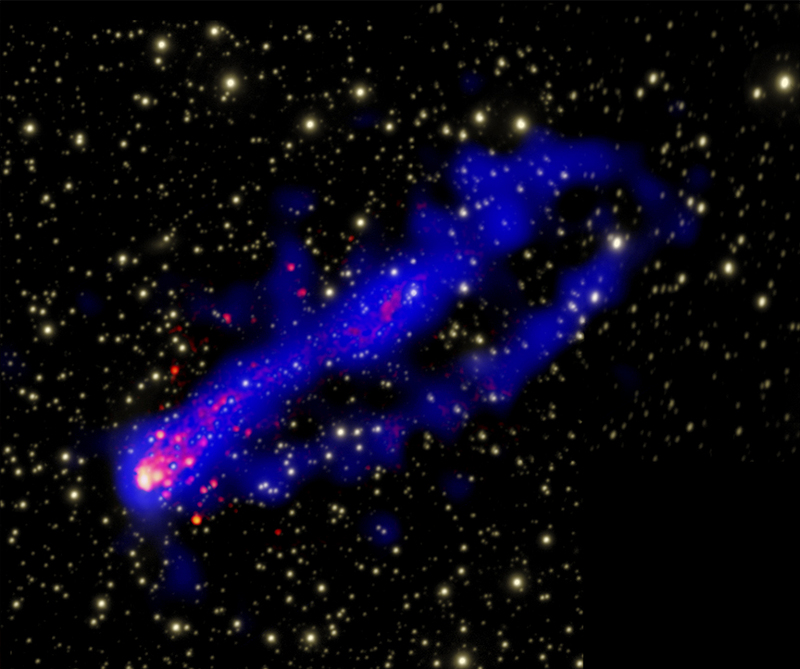 Two spectacular tails of X-ray emission have been seen trailing behind a galaxy using the Chandra X-ray Observatory. If this galaxy is so far away just how can it be using the Chandra X-ray Observatory. Real English is so much better when used precisely. I like this cluster of stars because of the color and the shape of it. That is a most interesting discovery and beautiful photo of a momentous event. Astronomy never ceases to amaze me. A galaxy plunging into the cluster Abell 3627. About 220 million light years from Earth. Chandra X-rays were combined with optical and hydrogen light from SOAR. About 320,000 light years across. X-rays are blue, optical data are yellow with hydrogen light in red. In the small constellation Norma ("right angle") in the southern hemisphere.